The main set of papers contained within form an extremely long letter written by Captain Pierrepoint to Lieutenant Colonel Sir Henry Edward Bunbury who also served in the Quarter Master General’s department, regarding his thoughts on the Corunna campaign, which he clearly wrote within a month or so, when his memory was fresh and many of the details of the campaign were still unknown to the general public. 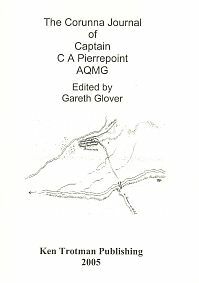 Captain Charles Alphonse Pierrepoint had served in the 20th East Devon Regiment, but had clearly been seeking to gain a permanent post in the Quarter Master General’s Office and it would appear that his appointment as an Assistant Quarter Master General for the Corunna campaign was no less than his fourth temporary appointment to the department already during his career, returning to the 20th after each short appointment. Pierrepoint was already in Portugal, mapping the sites of Wellington’s victories at Rolica and Vimiero when the call came to join Sir John Moore’s army in Spain. Having been delayed on route, he finally arrived with the army only a few days before the action of Sahagun which marked the apogee of Moore’s advance, very soon after, being forced into headlong retreat to escape the clutches of Napoleon and his greatly superior army. There are a number of journals already in print regarding the Corunna campaign, so why publish this one? Pierrepoint was appointed to the position of Deputy Assistant Quartermaster General to the ‘Reserve’ Division commanded by Major General Edward Paget consisting of five battalions of infantry numbering nearly 4000 men. The QMGs department on campaign was responsible for the marches of the troops, the quartering of the men at the end of each march and also providing some equipment and clothing. Pierrepoint clearly had a responsible position, helping to maintain the health and morale of the troops on a very trying retreat. It is also clear that when not sorting out the evening billets, he spent much time with Paget and the other senior officers of the division, observing at first hand much of the actions of the Reserve division, which acted as rearguard for much of the retreat and clearly had access to the views of many of his fellow officers regarding how the operations proceeded. Pierrepoint wrote of all he heard, but also gave his professional opinion of the retreat and is not afraid to criticise a number of aspects of the campaign, his unique position and his honest views are therefore of great value in our understanding of this campaign. Charles Pierrepoint returned to England with the army where he reverted to command of his company in the 20th Foot. Spain called again soon and we find him again attached to the permanent Staff of the Quartermaster Generals department, he became a Major on 26 September 1811 but he was killed at the Siege of Burgos. It is unclear how the additional letters in the folio came to be there however as they generally relate to the campaign I have chosen to reprint them within this booklet. The letters written by various naval officers clearly shows the intricacies of the retreat and the numerous problems this caused the Royal navy off the coast of Spain, perhaps a less well understood part of the campaign.